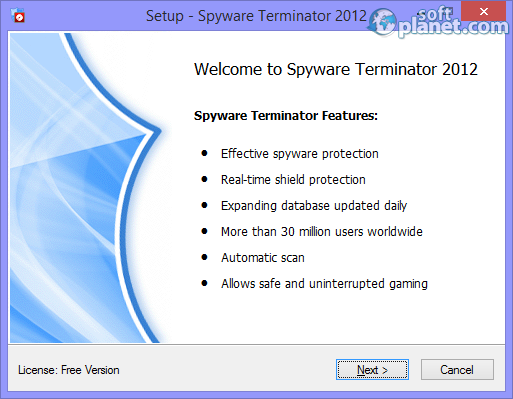 SoftPlanet makes it possible for everyone to get free Spyware Terminator 2012 download directly from our servers. There is no registration needed for downloading. It does not matter if you use your computer a lot or just a little bit in order to be infected with dangerous and harmful stuff. All kinds of adware and spyware attack all PCs around the world. Some of them are harmless, others are very dangerous. To be on the safe side you need to provide the best possible protection for your computer against threats. Spyware Terminator 3.0.0.101 is a very smart and reliable decision that can keep all threats away from your desktop or laptop. This freeware version of the program can significantly increase the level of protection that you need when you go online every day. 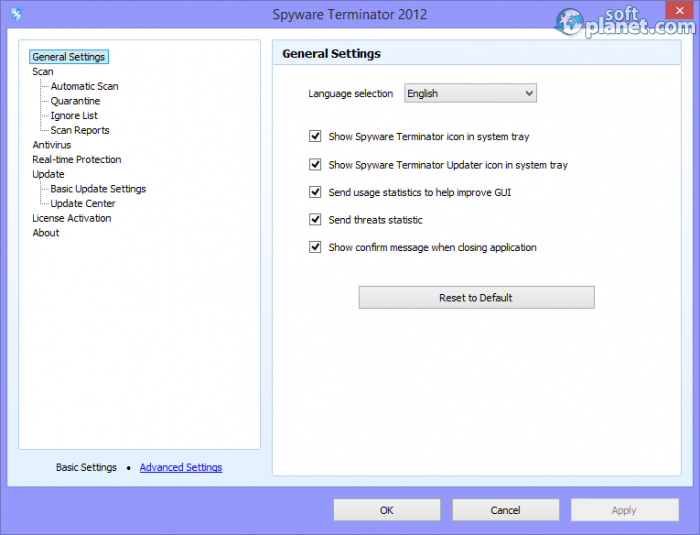 Spyware Terminator has free and paid versions. The paid one is fully featured while the free one does not have an antivirus scanner, antivirus real-time protection, high priority updates and advanced security tools. Despite that you will still receive antispyware real-time protection, automatic definition updates and host intrusion prevention system care. Users can download and install this app on any Windows OS version and in any of the many supported interface languages. Spyware Terminator has a very well designed user interface. All colors, tabs and menus are right on the money. In fact the antivirus protection is provided by F-PROT antivirus which is one of the oldest and most famous antivirus shields. The home application screen has three tabs on top – Main, Scan and Tools. All related to each tab tasks are listed to the left. There are three scanning modes – Fast, Full and Custom. Users can set all scans and updates to be upon schedule. The Tools tab offers a list of many useful utilities that come with the app such as: System Restore, Default System Settings, Hard File Remover, PC Optimizer, Online Backup and so on. Program settings can be seen if you click on the little arrow button next to the Tools menu and select Settings. There is a chance to change the interface language even after the installation process is over. 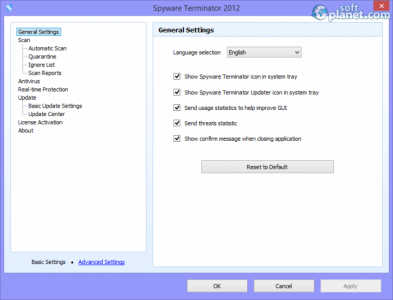 Spyware Terminator 3.0.0.101 is a very lightweight and at the same time tough for the threats program. Once you set it up it can protect you from all adware and spyware 24/7 and on top of that you can use it alongside with another antivirus program to increase the overall protection. Spyware Terminator 2012 is VIRUS-FREE! Our security scan shows that Spyware Terminator 2012 is clean from viruses. The current version of Spyware Terminator 2012 has been scanned by our system, which contains 46 different anti-virus algorithms. That ensures that Spyware Terminator 2012 3.0.0.101 is 100% safe for your computer.